Retirement is a milestone that countless workers look forward to. It’s also an expensive prospect that tends to catch seniors off guard. In fact, the U.S. Bureau of Labor Statistics (BLS) reports that the typical senior spends about $46,000 a year in retirement. Since the average retirement length in the country is 18 years, we can project that the typical retiree will need an $828,000 nest egg to pay the bills upon leaving the workforce. Of course, the challenge in planning for your golden years is that it can be hard to pinpoint exactly what your expenses in retirement will look like. Also, while the average retirement in the country is 18 years, if you retire early, you could be looking at 25 to 30 years or more. Here, we’ll review some common monthly expenses seniors face to give you a sense of what you might spend in retirement. We’ll also go over some tips for lowering your living costs, such as paying off your mortgage in advance. This way, you’ll be able to make the most of your various income streams, whether it be IRA or 401(k) withdrawals or your monthly Social Security benefits, and ensure that you have enough money coming in to live comfortably. Will your expenses go down in retirement? Many people assume that their expenses will go down in retirement, but in reality, you’ll likely come to find that many wind up staying the same. Think about the various things you spend money on today, like food, electricity, and cable. Just because you’re no longer working doesn’t mean you’ll need to eat less, light your home less, or stop watching TV. In fact, you may come to find that you end up spending more money, not less, once you stop working. According to the Employee Benefit Research Institute, 33% of households increase their spending during their first six years of retirement, and much of that boils down to the fact that their healthcare expenses climb and eat up much of their income. This isn’t to say that you’ll wind up spending more money in retirement than you did during your working years. In fact, seniors are generally advised that they’ll need about 70% to 80% of their former earnings to live comfortably. But if you have a host of known health issues or want to travel extensively during retirement, you should plan for a higher level of replacement income — perhaps 100% or even more. The money to cover your retirement expenses will need to come from somewhere, and the more income sources you secure, the greater your chances of not running into financial trouble later in life. First, there’s Social Security, which pays the average beneficiary today about $1,400 a month. If you were a higher earner, you’ll probably collect more, and if you were a lower earner or took an extensive break from your career, you might wind up with less. As a general rule, however, Social Security will replace about 40% of your previous earnings if you were an average earner. Contrary to what some might believe, it won’t be enough to sustain you in retirement without additional income. Another key source of retirement income will be your nest egg, which is why it pays to save aggressively during your working years. The amount you wind up with will depend on how much you set aside each year, how you invest your savings, and how your portfolio performs. No matter what your ending balance looks like, most financial experts recommend withdrawing about 4% of your 401(k) or IRA each year in retirement to ensure that you don’t deplete it prematurely. This means that if you retire with $1 million, you’ll have about $40,000 of income from savings to work with (though depending on the type of retirement plan you have, you might lose some of that to taxes). If you work for an employer who offers a pension, that’s another key source of retirement income to look forward to. With a pension, your employer essentially agrees to pay you a certain amount of money each month in retirement, usually calculated as a percentage of your ending salary coupled with the number of years you worked for the company in question. Unfortunately, pensions are no longer as popular as they once were, so if you don’t have access to one, you’re in good company. It also means that you’ll need to step up your savings game to ensure that you have access to the money you need in retirement. Finally, you might snag yourself some extra money in retirement by working part-time, monetizing a hobby, starting a business, or renting out your home in some capacity. These are all options to consider if you’re worried that you won’t have enough income to cover the bills from your primary sources, like your nest egg and Social Security benefits. The expenses you incur in retirement, and the amount they cost, will depend heavily on the choices you make and the priorities you set. If you retire in a city, for example, your transportation costs might amount to virtually nothing if you’re able to walk mostly everywhere. Similarly, if you’re not a TV fan, you might save money in retirement by canceling cable and spending your time doing other things instead. Still, the following is an overview of the expenses seniors typically face so that you can plan for them accordingly. As is the case during your working years, housing might constitute your single largest monthly expense in retirement. According to the U.S. BLS, housing costs the average senior $1,322 a month, but if you live in a pricey part of the country, that figure might easily double or triple. The good news, however, is that you can take steps to keep your housing costs to a minimum. First, aim to pay off your mortgage before you retire to eliminate that monthly payment. Next, consider downsizing to a smaller home that’s easier to maintain. After all, it stands to reason that a 1,500-square-foot home will cost you less in upkeep than one that’s 3,000 square feet in size. Another option? Consider renting in retirement rather than owning if you’re able to find a low-cost home. When you rent, you eliminate many of the expenses associated with homeownership, like property taxes, maintenance, and repairs. And while you’ll still need insurance, renter’s insurance is often less costly than buying a homeowner’s policy. The one problem with renting, though, is that you lose the tax breaks associated with owning property. But if you’re not planning to itemize on your tax return, that won’t be an issue. Healthcare costs the average retiree $499 a month, but if you have multiple medical issues to contend with, you might end up spending more. Many seniors are surprised to learn that healthcare gets so expensive in retirement, and part of the reason is that Medicare isn’t free and doesn’t cover many of the services retirees come to need. Though most enrollees don’t pay a premium (the monthly fee, so to speak, that people pay in exchange for health insurance coverage) for Medicare Part A, which covers hospital stays, Part B and Part D, which cover diagnostics and prescriptions, respectively, charge a monthly premium for coverage — the same kind health insurance companies impose. On top of that premium, you’ll be responsible for deductibles and copays for the services you use. Your deductible is the amount you’re required to pay out of pocket before your insurance company — in this case, Medicare — starts picking up the tab for your services. Your copays, meanwhile, are a fixed amount that you’re charged every time you see a doctor or fill a prescription. Then there are those services that Medicare itself won’t pay for, like dental, vision, and hearing aids. Having to cover these costs in full can really put a strain on your retirement budget. Thankfully, there are steps you can take to lower your healthcare spending as a senior. First, take advantage of Medicare’s free preventive services. You’re entitled to a no-cost well visit once a year, as well as a host of other benefits. Next, consider getting a Medicare Advantage plan as an alternative to traditional Medicare. Most Advantage plans cover services like dental, vision, and hearing, and many offer additional perks like coverage overseas, which traditional Medicare doesn’t offer. And if you shop around, there’s a good chance you’ll find an Advantage plan that’s cheaper than original Medicare. Another way to keep your medical costs down is to be smart about prescriptions. Ask your provider to prescribe generics (which are copies, so to speak, of brand-name drugs that have the similar effectiveness but tend to come at a fraction of the cost) whenever possible because doing so might save you a bundle in copays. Also, aim to order the medications you take regularly in 90-day supplies, as doing so is generally cheaper than renewing month to month. Finally, don’t be shy about asking for medication samples whenever you go to the doctor. Physicians are often inundated with them, and they’re generally happy to share. Furthermore, be sure to review your Medicare plan options year after year. While you don’t get a say in Parts A and Part B, you get to choose your own Part D drug plan during Medicare’s open enrollment period. If you take the time to research the different plans out there, you might find one that offers better coverage for your medications than the one you’re currently on. Similarly, plan formulas change year after year so that a given plan might provide great coverage for the drugs you take at present, only to lower that level of coverage in the future. In other words, don’t assume that if your plan name stays the same, its coverage will follow suit. In some cases, paying $10 more per month in Part D premium costs might actually lower your prescription copays by $30, thereby saving you $20 a month, or $240 per year. Transportation is the one expense in retirement that’s more likely than not to go down. That’s because cutting out your daily commute can save you a nice chunk of money on things like public bus or train passes, fuel, tolls, and automobile maintenance. In fact, leaving the workforce might even enable you to get rid of a car, thereby saving yourself thousands of dollars each year on expenses like insurance and repairs. The average retiree spends $567 a month on transportation, which is about one-third less than adults of other ages. That said, you can make an effort to keep your transportation costs down. For one thing, run the numbers and see if it makes sense to get rid of a vehicle. AAA reports that owning a car costs $725 a month on average, so if you only expect to need a vehicle once a week, paying $40 a pop for a taxi or rideshare makes more sense financially, as you’re looking at $160 total rather than roughly four-and-a-half times that amount. Additionally, see if you’re eligible for a reduced fare on public transportation — it’s often the case that seniors are. We all need to eat, regardless of our work status. But where we eat could have a huge impact on how much we spend. 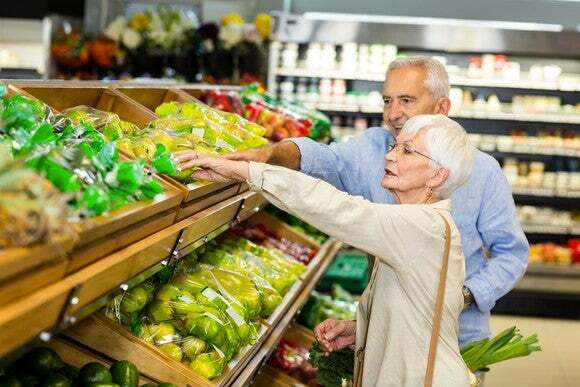 Food costs the average retiree $483 a month, but shopping smartly can help cut that number down further. Avoiding restaurants is a good way to keep your food costs down since most establishments charge a 300% markup on the items they serve. If you are going to dine out, do so sparingly, and aim to capitalize on those early-bird specials whenever possible. For example, if you dine out once a week and spend $50 per meal, generally speaking, the same dish at home will cost you just $12.50 to prepare. Therefore, cutting out two restaurant meals each month might save you $900 a year. To keep your grocery bills down, meanwhile, take inventory at home and make a list of the things you need on a weekly basis. Then, stick to that list when you’re at the store, and resist the urge to buy things just because they’re on sale. When you buy needless items, you increase your risk of having them spoil and throwing them out along with the money you spend on them. Furthermore, spend some time scanning circulars and searching online for coupons on the items you typically buy. Incidentally, this is also a good way to occupy some of the newfound free time you’ll have as a senior. Finally, be smart when buying in bulk. Don’t load up on items unless you truly use them regularly, and make sure you have adequate storage available before bringing them home. The last thing you want is to buy a caseload of product, only to have to dump half of it when you realize you don’t have the fridge space. Clothing costs the typical retiree about $118 a month, which is a reasonable amount when you consider that common items can only withstand so many washes and wear and tear. Still, there are ways to keep your clothing budget in check. First, shop the thrift stores. If you’re willing to spend a little time searching through those crowded racks, you might find the things you need for less. Furthermore, you’ll generally find items on sale once their season has just passed so that if you look for a winter coat in April, you’ll probably get a better deal than if you were to buy one in December. Let’s imagine you typically spend $118 a month on clothing, but are able to shop off-season and slash your costs by 30%. At the end of the year, you’ll have banked an extra $425. Once retired, you’ll face the same basic utility costs that working adults face as well, such as water, heat, and electricity. The typical U.S. family spends $2,060 per year, on average, on utilities, but the amount you spend will depend heavily on the size of your living space and your personal habits. Now there are several things you can do to lower your utility costs, and many of them boil down to common sense, like not running the water longer than necessary and turning off lights when you’re not home. But perhaps the most efficient way to minimize your utility spending is to keep your square footage down and upgrade inefficient appliances that are on their way out anyway. In doing so, you might even qualify for rebates or tax breaks that make those updates affordable, all the while saving you money in the long run. Imagine it costs an average of $300 per month to heat and cool your 3,000-square-foot home. If you move to a home that’s half its size, you might spend half as much, thereby saving yourself $1,800 a year. Similarly, if you have an old fridge that costs you $400 a year to run, replacing it might cut that expense down to $200. Now you might spend $800 to replace that fridge, but you’ll break even after four years and bank some savings each year thereafter. Plus, you might snag a tax break the year you make that upgrade. Retirees still need access to the outside world, whether in the form of cellphone service, cable, or the internet. Nailing down an average cost for these services is difficult, because there are so many different cellphone providers, internet plans, and cable packages to play around with. You can keep your costs down, however, by opting for the most basic services out there. In other words, if you don’t expect to use your mobile phone a lot for data, don’t buy the pricey data plan. Similarly, if you’re content with just a handful of channels, see if the right antenna will spare you a cable bill each month, or if you can piece together some low-cost streaming options that allow you to cut the cord. Even if you feel you have to stick with cable, there’s no need to overpay. Cable TV costs the average subscriber $85 a month, but you can trim that down to $20 by opting for a limited basic package with just a handful of essential channels. All told, that’s a savings of close to $800 a year. Being retired means having a lot of extra time on your hands, and occupying that time has the potential to cost you a fair amount of money. The average senior today spends $197 a month on leisure, which is actually pretty reasonable. But if you want to lower that figure, be smart about snagging senior discounts. You’ll often find them in places like museums, movie theaters, and even national parks. Better yet, do some legwork and find out where to score free entertainment in your neighborhood, whether it’s concerts at the local park or admission-free days at area hotspots. And remember, outdoor activities like hiking and nature walks are always free of charge. Another way to score some free leisure? Volunteer. Some museums offer free admission for those who give of their time, so if there’s a museum you frequent each month that charges a $15 entrance free, eliminating that fee will put $180 back in your pocket after a year. Of course, many seniors don’t just choose to stay local. Rather, they opt to travel extensively. If you’re going to spend your golden years traversing the globe, you’ll most likely spend far more than $197 a month, but that doesn’t mean you can’t take steps to cut corners. First, map out a travel budget that prioritizes the trips you really want to take. Then, explore your options for pulling off those itineraries less expensively. You’ll often find that traveling at off-peak times makes things far more affordable, so if spring is the most popular time to reach one of your most desired destinations, try postponing that trip to the summer or fall and seeing if that helps keep your costs down. Driving to domestic destinations instead of flying can also help you limit your spending, as can staying flexible. Some hotels and airlines, for example, slash prices at the last minute when rooms or flights haven’t sold. If you’re willing to play your plans by ear — which is certainly more feasible when you don’t have a job weighing you down — you might score a serious discount in the process. Also, when possible, secure lodging that comes with a kitchen and prepare your own meals rather than dine out. Spending $100 on groceries for a four-day getaway instead of dining out every day could save you hundreds of dollars on that trip. Finally, it’s wise to plan on front-loading more of your travel during the earlier stages of retirement, and cutting back later on. The reason? As you age, reaching those far-off destinations and enjoying them to the fullest might be challenging, so you’re better off planning for those expenses earlier on. Also, since you’re more likely to encounter health issues as you age, you might find that you simply don’t have the money to travel later in life. While all seniors will inevitably face medical bills, some may be lucky enough to avoid the colossal expense that is long-term care. Long-term care refers to ongoing care that’s needed to allow patients to function. While disabled younger adults might need long-term care, it’s a term often associated with seniors, and it encompasses everything from nursing homes to assisted living facilities to home health aides. It’s estimated that 70% of folks 65 and over will end up requiring some type of long-term care in their lifetime, and that’s something you’ll need to plan for. According to Genworth Financial’s 2017 Cost of Care Survey, the average assisted living facility in the country costs $3,750 per month, or $45,000 per year. The average nursing home, meanwhile, costs $235 per day, or $85,775 per year, for a shared room, and $267 per day, or $97,455 per year, for a private one. Now in the case of the latter, bunking with a roommate is clearly a good way to keep your costs down, but an even better solution is to invest in long-term care insurance during your 50s or 60s. Having a policy in place will help defray the costs you’ll otherwise face. Of course, that policy will come at a price. The average long-term care insurance annual premium costs $3,490, and if you end up paying that over the course of 25 years, that’s a whopping $87,250. However, that sort of premium might buy you over $666,000 in coverage, according to the Long-Term Care Insurance Price Index. The precise level of coverage you get will depend on the plan you choose. Some plans, for example, cover in-home care only, while others cover everything from home aids to nursing homes. Furthermore, some plans come with a daily care allowance (for example, a plan will pay up to $70 a day for covered services), while some come with monthly or annual allowances. Another thing to keep in mind is that the younger you are when you apply for long-term care insurance, the more likely you are to not only get approved, but snag a health-based discount on your premiums. Now if you’re relatively healthy, you may not need to apply for a policy until you’re close to 60. But be careful from that point on, because premium costs can jump substantially within a relatively narrow age range. Case in point: Long-term care insurance premiums that begin at age 65 are 8% to 10% higher than premiums that begin at age 64, according to AARP. There’s also the danger of only getting approved for limited coverage, or not getting approved at all, if you wait too long to apply for long-term care insurance. Either way, as is the case with life insurance, the worse your health is at the time of application, the lower your chances of snagging a competitive rate (if you’re even lucky enough to get a policy). Retirement can be an expensive prospect, but a manageable one if you go in prepared and make an effort to keep your costs as low as you can. A good way to do so is to create a budget before you actually retire that maps out your monthly expenses. The benefit of having a budget is that it’ll make it easier to identify spending categories with room to cut corners if needed. It’ll also help you determine whether you’re actually positioned to retire or not. Specifically, think about whether each individual category is likely to go up in retirement, go down, or stay the same. For example, you might assume that you’ll spend less on clothing once you no longer have to maintain a business wardrobe. At the same time, you should probably assume you’ll spend more on heat and electricity, since you’ll be home more often. After you’ve assessed each recurring monthly expense you’re likely to face in retirement, list those expenses and total them up. Then, factor in one-time expenses that will pop up throughout the year (such as an AARP or warehouse club membership, for example). Also be sure to factor in whatever travel you’re planning to do. Once that’s done, assess your various income steams, including your savings, pension, and Social Security benefits, to ensure that you truly have enough money at your disposal to cover your bills and expenses. If you don’t, you’ll need to either reconsider the lifestyle you’re planning to lead or come to terms with working longer to boost your savings (and possibly your Social Security benefits as well). Now if you’re collecting Social Security or a pension, you’ll know in advance how much money to look forward to each month. If you’re looking at a lump sum in your nest egg, it’s not as simple, but as stated above, you can expect to withdraw about 4% of your savings’ value each year without having to worry about prematurely depleting those funds. Going back to our previous example, this means that if you retire with $1 million, you’re looking at about $40,000 a year to use. Keep in mind that retirees are by no means exempt from paying taxes. The money you withdraw from your IRA or 401(k), for example, is taxable unless you have a Roth account. Similarly, depending on your total income and where you live, some of your Social Security benefits might be taxed. Therefore, if you’re planning on collecting $17,000 a year in Social Security and withdrawing another $40,000 a year from savings, don’t assume you’ll actually have $57,000 a year to spend. If you fall into the 25% tax bracket, for instance, then your $40,000 from savings will only translate into $30,000 of usable money. Now let’s assume you’ve totaled the expenses in your budget and have determined that you’re looking at $4,000 a month, or $48,000 a year. If you’re anticipating $17,000 a year in Social Security income (we’ll assume that’s a post-tax figure for simplicity purposes) plus another $30,000 in post-tax retirement plan withdrawals, it means you’ll be $1,000 short. If that’s the case, you’ll want to implement some of the smaller changes mentioned above, like cutting back on cable. On the other hand, if your expenses come in at, say, $5,000 a month, or $60,000 a year, you’ll need to take more drastic measures to avoid going over your budget, such as downsizing or unloading a vehicle. Finally, set priorities so that the money you do have serves the purpose of buying you an enjoyable retirement. If having a more comfortable home means a lot to you, spend your money there. But if you’ll get more pleasure out of occupying your days with fun, engaging activities, then rent a small apartment and pay more for entertainment. While some retirement expenses are unavoidable, you’ll likely find that many come with wiggle room, so it’s up to you to make smart choices about where your money goes.